Following the unveiling of its first crossover, Captur, which arrives in Ireland in July, Renault has redesigned the popular Scenic as a crossover and unveiled the new Scenic Xmod has arrived in Irish showrooms. It is more sporty and elegant. 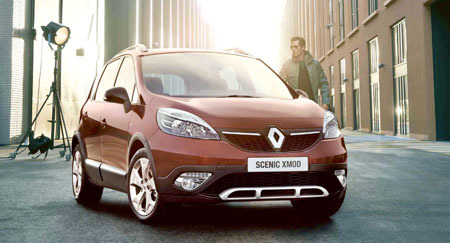 The new Scenic Xmod combines the outdoor cues of a crossover with the refined world of an MPV. With a raised ground clearance and exclusive alloy wheels, the car features an expressive crossover-inspired design. It gets new front and rear bumpers, sill guards, and chrome-finish roof bars across the range. The new front radiator grille is also more expressive, incorporating Renault’s new design identity and signature LED daytime running lights. It first hit European roads in 1996 and there have been over 4.3 million Scenics manufactured. Some would say, it has become an iconic small/medium MPV, and it has been a popular choice of many Irish families. To mark the launch of the new Scenic Xmod, new Scenic and new Grand Scenic have also been restyled to take on Renault’s new design identity. The Renault logo at the front is now bigger and set against a gloss black background that emphasises the new grille. Elegant lines and high-quality materials also help to enhance the MPV’s dynamic, family-orientated feel. The new Scenic Xmod retains the genetic make-up and practicalities of the benchmark MPV, but has a more sporty and exciting look. In Ireland, the Scenic Xmod will be available in two diesel Stop & Start engines, acknowledged as being the most fuel-efficient in their categories, the Energy dCi 110, and dCi 130 engine. The Energy dCi 110 engine has a fuel consumption of 4.1 litres/100 km and a CO2 emission rating of 105 g/km: simply the best ratings on the market in the category. The Energy dCi 130 engine has a fuel consumption of 4.4 litres/100 km and a CO2 emission rating of 114 g/km: here again the record holder in its category. The dCi 110 engine will also come in EDC version. And it will also be available in the new Energy TCe 115 Stop & Start petrol engine with a fuel consumption of 6.1 litres/100 km and CO2 emissions of 140 g/km. The Scenic Xmod will come in two editions in Ireland, the Dynamique and BOSE.